Cherry Mobile has just announced in their official Facebook fan-page the release of Cherry Mobile Superion series, the Cherry Mobile Superion Voyager and Cherry Mobile Superion Discover. These tablets are revealed to have SIM slots, hence a 3G capability. 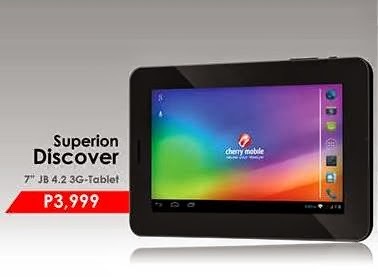 Running on Android 4.2 Jelly Bean (Both tablets), first impression would be the size and price, as far as the pictures are there we can say that Superion Voyager has more advance specs than Superion Discover, considering a 1K difference. What first came to my mind (another CM Fusion Bolt), but FuBo has no SIM Slot, while CM Superion Discover has that supports 3G, call and text function. Regular tablet size of 7.0 inch on Android 4.2 Jelly Bean. We still don't have a clue if its dual core or quad core, but one thing is for sure "its coming" for only Php3,999.00 (Official SRP). This one is bigger on a 8.0 inch XGA display, Dual Core, with 3G capability, call and text function, and of course a mini SIM slot. Also running on Android 4.2 Jelly Bean. A little knowledge about XGA or Extended Graphic Array, it is known to support full color display at 720p resolution or 1024 x 768, although that's just a speculation it might have similar outcome. 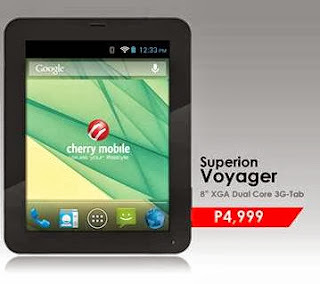 Priced at Php4,999 (Official SRP). Note: Full specification is yet to be announced, as well as availability, stay tuned!